Rebecca Neumanner's marriage is on the brink of collapse, as her desire to be a mother becomes an obsession. Then she receives news from her estranged family in Rhodes. I absolutely found myself immersed in Patricia Wilson’s writing in her novel Island of Secrets and I was eager for a new release so I could get lost in her wonderful descriptive writing again. 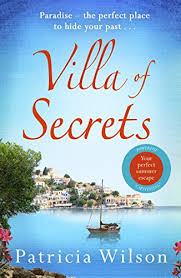 When I read the synopsis for her new release Villa of Secrets it sounded so promising and I couldn’t wait to begin. Sisters Naomi and Rebecca have been estranged for years after a family dispute lead to Rebecca leaving Rhodes to live in Bromley in England. The women now live very different lives but both face their own struggles but this must be put aside when their Grandma Bubba has a stroke and important information has come to light that requires the family to come together and it is time to truly get to know their dear Bubba through her diaries. This storyline was told from the past and the present and I have to say although I loved both telling's. the present was told from Dora’s personal diaries and it was these memoires that I enjoyed the most. The author has such a skilled way of weaving the past and present together to create such a compelling storyline that flows perfectly. I am not a great fan of storylines told from dual time zones but this book is definitely an exception. I loved the comforting and communal feel I got from the setting in Rhodes where Naomi and Bubba live, with friends passing by whereas when we meet Rebecca in Bromley which in itself was a shock to see somewhere so close to where I live appear in a novel it felt so cold and lonely a complete contrast to what I loved from Rhodes. Through Dora’s diary we get to see great insight into what devastation she faced during her fight for survival and desperation to do her part to end the war so she could be reunited with her family. Dora was a remarkable young woman who had to grown up hard and fast. She was a selfless and courageous young woman who suffered through so much loss and her honesty and at times confusing emotions that she shares within her pages really touched my heart. How someone can face so much heartache through their lives and manage to conceal this from those around them is such a selfless act. The ending of this book was such a poignant part and really brought a lump to my throat. I love this authors descriptive writing style and her storylines are so captivating I can not wait to see what her third novel will bring.